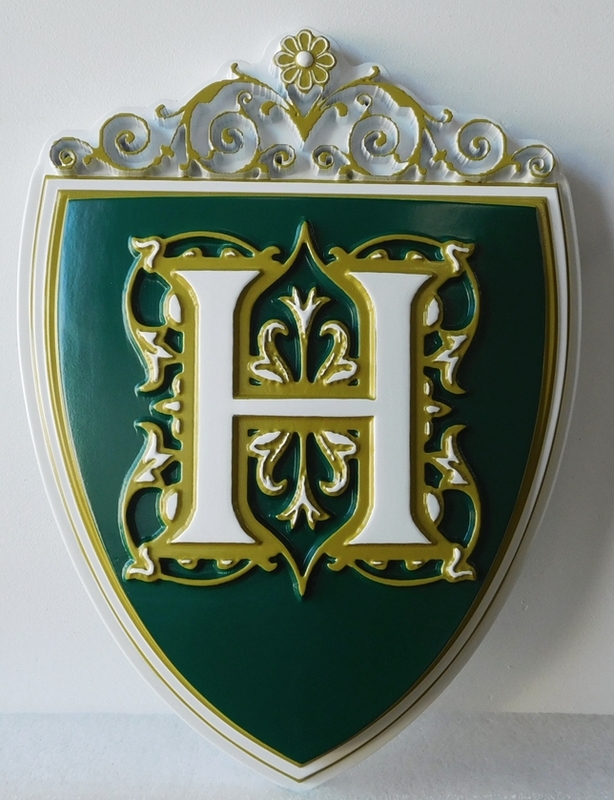 This coat of-arms logo wall plaque designates this upscale hotel .It is carved in 3-D bas trelief and artist brush painted in royal green white and metallic gold. The sign is clear-coated twice for additional weather and UV protection. This plaque can be mounted outside thebentrance door of the hotel on an adjacent wall or in an interior lobby . We can make sandblasted or carved 2.5-D, 3-D, or engraved (V-carved or flat bottom) signs for hotel , B&B or inn, with any custom design, in any size from 2 ft to 16 ft wide. These can be placed on an inside or outside wall, on a stucco, stone or brick monument base or pedestal, between iron or wood posts,or hanging from an overhead scroll bar or other ironwork or wood beam. We can customize these signs with any shape, border, font style, art, or color scheme with engraved or raised text and art of your choice . To see over 125 other signs for hotels, motels, resorts, B&B's, and inns, please click on "Return to List" below right. For more information on design options, prices, and delivery schedules, please call 951-698-8484 or email us at info@artsignworks.com, and our helpful and knowledgeable customer service representatives will respond promptly. Please click on Home to see our Home page. You can click on one of the numbered gray boxes on the lower left margin of this page to visit other Photo Galleries, such as signs for restaurants, bar & pubs, and wineries.. You can search for a specific sign type on this website by typing in key words in the Google Search bar at the top of this page. You can use the navigation dark gray tabs at the top, or the gray boxes on the upper left margin to see other information such as "Prices & Design Options" and forms for "Request a Quote and Design" and "Place an Order". To see other EPS dimensional monument signs, premium 3-D or 2.5-D carved, sandblasted, or engraved, High-Density-Urethane (HDU) or wood signs for hotel, motels, inns, and B&B's in Gallery 29, , please click o,n "Return to List" below right.